Russell Westbrook, Patrick Beverley: The live-ball timeout is the dumbest rule in sports. 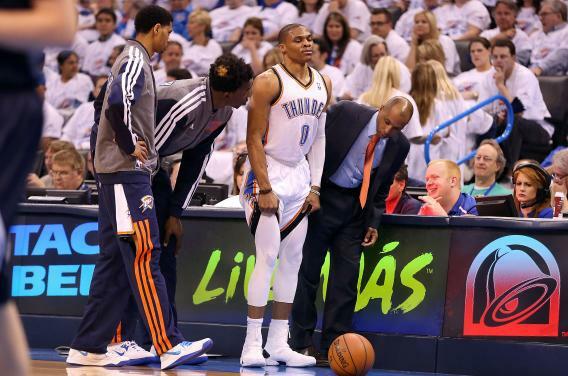 OKLAHOMA CITY, OK - APRIL 24: Russell Westbrook of the Oklahoma City Thunder is looked at by a trainer after a leg injury during Game Two of the Western Conference Quarterfinals. Halfway through the second quarter of Wednesday night’s Rockets-Thunder game, nine guys on the court stopped trying. With Houston up by one, Oklahoma City coach Scott Brooks wanted his team to call timeout. Russell Westbrook dribbled the ball casually across half court, while his four teammates and four of the Rockets ceased playing in anticipation of walking to their benches. The only guy who didn’t slow down was Houston guard Patrick Beverley, who tried to swipe the ball and ended up side-swiping Westbrook. Should Beverley, an impetuous rookie, have known better than to have pawed at Westbrook when he was just trying to call time? Is all fair in playoff basketball? Feel free to have that debate in the comments—there are reasonable arguments to be made on both sides. I’m going to focus on a more radical agenda: It’s time to abolish the live-ball timeout. The NBA’s timeout policies are dumb for a lot of reasons, many of which I laid out in a 2006 rant on the subject. They kill the suspense and momentum at the end of close games; they give coaches too much control over what should be a free-flowing sport; they allow teams to magically advance the ball to half-court, violating the rules of time and space. But the live-ball timeout is the lamest of them all. I can understand allowing a team to huddle up after a stoppage of play—when the ball goes out of bounds, or when the opposing team has scored a basket. The fact that a player can call timeout when he’s dribbling the ball up the court, though, is an affront to everything that athletics should be about. It is the worst rule in all of sports, and right-thinking people must band together to eradicate it once and for all. In the interest of fairness, I’d love to run through a list of the positives associated with calling a timeout in the middle of game action. But there are none. The live-ball timeout is pure evil. Abolishing the rule would make a lot of things about NBA basketball better, and it wouldn’t make anything worse. Sure, maybe the coaches would whine about how they couldn’t draw up as many plays. Well, boo hoo Erik Spoelstra—I’m sure LeBron will be able to come up with something on the fly. And if players and coaches wanted to call for a TO under a no-live-ball-timeout regime, they’d still have ample opportunity to do so after every foul call, turnover, made basket, and deflection out of bounds. In the absence of live-ball timeouts, players would get to make more decisions on their own and defenses would get rewarded for making great plays. Plus, in this counterfactual universe, Russell Westbrook would still be playing. Thunder fans, are you with me?